Whether you want decorative floor coating systems that can withstand constant foot traffic or heavy point loads, we have the combination of beauty and strength that you need. Our quartz, chip blends & metallics all create lustrous finishes that handle wear and tear, so you’ll continue to benefit from eye-catching flooring that’s as durable as it is attractive. Our selection of decorative floor coating systems, including quartz, chip blends & metallics, give you the options you need to suit any space. Our beautiful colored quartz blend and resin system offers the extraordinary strength and impact resistance of an aggregate-filled floor and can be applied using broadcast, slurry or trowel methods. 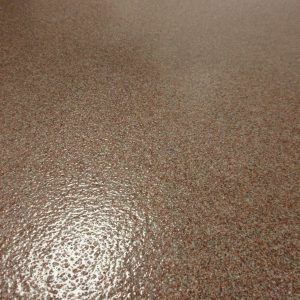 Innovative colored chip blend and resin finishes provide the look of terrazzo at a fraction of the price, and cost much less to maintain with no waxing or special buffing needed. Our metallic “faux stain” flooring provides the organic beauty of stained or polished concrete, but with far superior performance. In public spaces, stained concrete wears away, losing its color and finish, showing traffic patterns and drawing attention to patches, repairs and porous concrete. Our high performance, “faux stain” metallic powder floor coating systems, on the other hand, install predictably to help hide, rather than emphasize, concrete substrate imperfections. Their gorgeous, flowing patterns apply evenly and resist wear steadfastly, thanks to their industrial-grade resin and mineral aggregate components. Who says high performance can’t be beautiful, too? 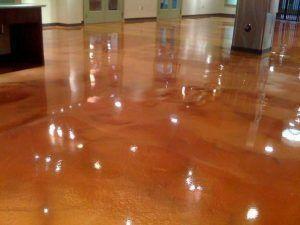 Our decorative epoxy floor coating systems and other resinous materials prove that beauty isn’t just skin deep. 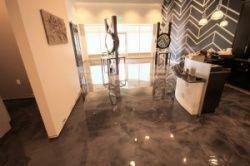 Don’t let the stunning decorative finish fool you—these floors are tough. Depending on your concrete floor structure and facility needs, they can be up to 1/4″ thick or more, with impact resistance and compressive strength as impressive as the strongest heavy-duty industrial concrete flooring system.